FutureHAUS, Virginia Tech’s first place entry at Solar Decathlon Middle East in 2018, is reinventing how builders construct houses. Wheeler’s team had to build the FutureHAUS from scratch after a 2017 fire destroyed all of the university’s prototypes, going back to its first Solar Decathlon winner, LumenHAUS, from 2010. The FutureHAUS team viewed this unfortunate event as an opportunity, and made the 2018 competition in Dubai their deadline for rebuilding. Their efforts produced FutureHAUS in just a year and a half, with a construction period of about six months. The 900-square-foot home hinges on the team’s signature modular building technology. It is constructed from 18 separate “cartridges” built in a production facility and delivered complete to the jobsite. A typical cartridge is about 3 by 12 feet and just under 10 feet tall. When packed, all cartridges fit on a flatbed truck, allowing for easy delivery, especially in crowded urban centers. The cartridges, which are delivered “gift wrapped”—fully finished with everything from electrical and plumbing systems to cabinetry, technology, and surface finishes—are stacked together onsite. Each piece has its own electrical subpanel which easily ties into the main electrical panel with just three wires. 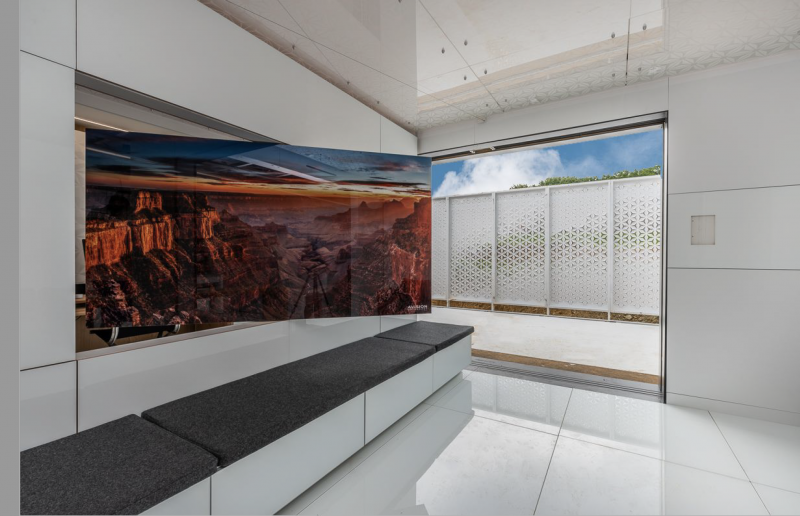 As a Solar Decathlon winner, one of FutureHAUS’ obvious benefits is its solar power capabilities. 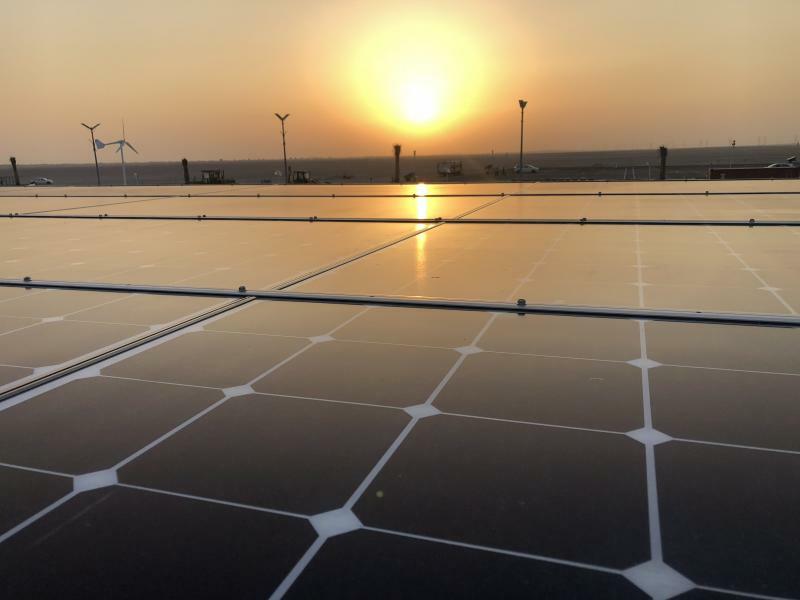 Five of the home’s cartridges are solar arrays, which shipped to Dubai pre-assembled and were plugged into the main system using the same three wire system as the rest of the house. For the extreme heat and sun of Dubai, the team developed a racking system that holds the solar arrays above the roof, providing shade for the building while soaking up energy. According to Wheeler, this keeps the roof at ambient temperatures and reduces the energy load of the house by 51 percent. The entire home is cooled, even in the desert, with a 1.5 ton HVAC system. The home also produces enough energy to charge an electric car and occasionally send energy back into the grid. 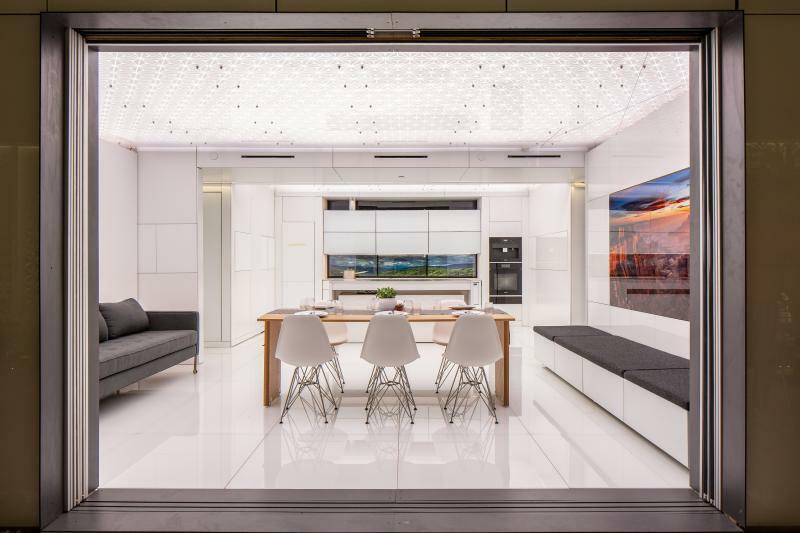 On the interior, FutureHAUS’ ultra-modern, high-gloss white finishes hide a big secret: the home uses no drywall. Instead, the walls are constructed from glass and MDF panels with Sugatsune clips that can be removed individually to access the electrical workings behind them. This wall system was a priority for FutureHAUS, which features a fully connected and integrated IoT network of smart products. Gorilla Glass touch screen panels, created in partnership with Corning, Cat-i Glass, and SnapCab, are embedded in the walls to control lights, HVAC, music, and more. As part of an education organization, Wheeler says his team relishes the opportunity to learn from residential construction industry experts. Throughout the development process, FutureHAUS became a R&D test bed for several home product manufacturers, from Wood-Mode and Kohler to DuPont and Weyerhaeuser. A combination of partnerships resulted in an innovative solution for accessible kitchens. The kitchen’s upper cabinets, part of a system constructed by Wood-Mode, can lower with Linak actuators to meet the countertop, making the top shelves easily reachable for children or individuals in wheelchairs. The same technology can move the bathroom vanity and Kohler wall-hung toilets. The kitchen faucet, also from Kohler, tucks out of the way into the upper cabinets, and can be controlled with voice commands in addition to manual knobs. Additional aging-in-place accomodations come from the home’s LED lighting grid, which operate automatically by following body weight throughout the home, keeping surroundings visible at all times. The system’s floor sensors can also alert a caregiver if they sense a slip or fall. For maximum space utilization in a small footprint, FutureHAUS features a flexible floorplan. Two main walls on either side of the living room are movable, dividing the space between the bedroom, living room, and home office based on daily needs. When the bedroom’s murphy bed is folded away, the moving wall turns the bedroom into a closet, adding up to 10 feet to the living room for entertaining guests or other occasions. On the other end of the living space, the home office can be expanded from behind the AV wall, and the TV screen can be rotated to face either room as needed. A number of additional thoughtful technological touches separate FutureHAUS from traditional homes. The kitchen island features an induction cooktop hidden beneath the Schott glass counter surface, becoming additional workspace when not in use. The island glass also houses a TV screen, becoming a family hub. Embedded transducers turn the glass walls into a home speaker system. 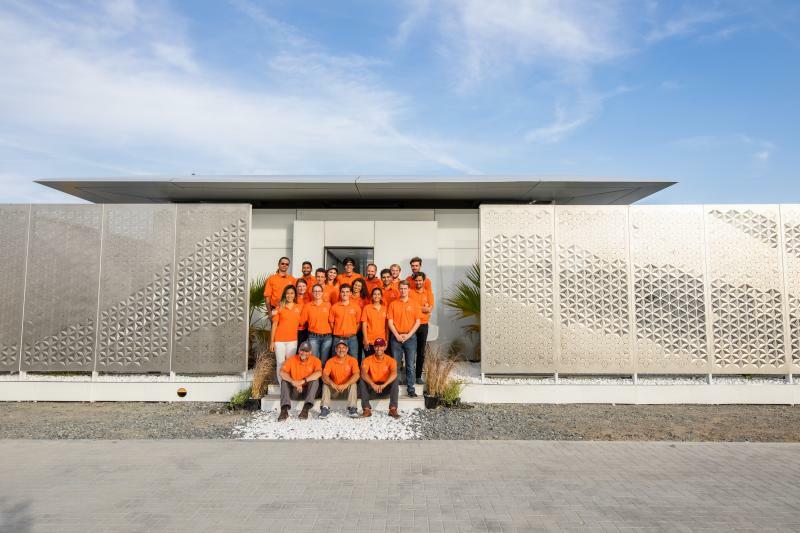 At the Solar Decathlon competition last November, the FutureHAUS cartridge system gave the Virginia Tech team a distinct advantage: All of their factory-made components were shipped to Dubai fully furnished, saving the team construction time and allowing extra time for testing and prep work. Wheeler hopes to see these efficiency savings translate to real-world housing developments. In its first market application, the FutureHAUS team is partnering with Dominion Energy to create a micro-grid solar community in South Boston, Va., providing affordable homes for young people in the area. Though they won’t have all the luxury finishes and technology of the FutureHAUS, the townhome-style structures will still include several smart and space-efficient features. me gustaria recibir mas imformacion del tema.